Anthony Tomasso has been beekeeping for over 30 years. What began as a hobby became a business when Anthony left his work as a contractor behind. Building his own hive boxes and frames, Anthony was drawn to beekeeping as an essential aspect of farming. He comes from a family of farmers and talks of a time when everybody had four or five hives on their property for the sake of honey and pollination. Getting involved with bees was a means for Anthony to develop a relationship to the land and build community by selling his honey at farmers' markets. 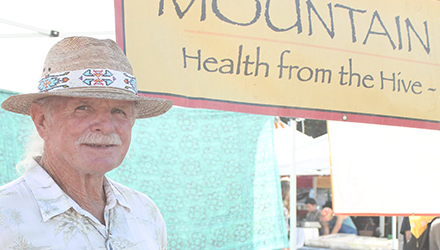 Anthony Tomasso, owner of Aptos Apiaries, runs a small business, producing between two to four thousand lbs. of honey annually. He specializes in delicious, all-natural honey and honey-based products that promote health and wellbeing. Visit them year-round at the Downtown Farmers’ Market. "The bees harvest everything," Anthony says, "I just have to be in harmony with them". Through keeping bees Anthony has developed a keen awareness of what’s in bloom, what weather is coming and the affects that pollinators have on the land. With a large garden including avocado, apple and citrus trees, he has noticed that the years he keeps many hives on his property the trees produce much more fruit. This is why almond farms in the Central Valley are paying $200 per colony to bring hives onto their farms. With 2.5 hives per acre almond production can increase as much as seven times.